Make this Sausage and Egg Breakfast Casserole recipe to feed a crowd. It's loaded with sausage, egg, and cheese for a hearty breakfast. This prepare this easy breakfast recipe the night before and impress your guests. Sautee the onions and green peppers in a large skillet on medium-high heat for about 3 minutes, until they start to soften. Add in the sausage and cook until the sausage meat is cooked through. Whisk the eggs, milk, salt and ground black pepper together in a large bowl. Set aside. Lightly oil a 9x13 baking dish. Layer the croutons evenly on the bottom. Layer the sausage mix on top of the croutons. Evenly layer the grated cheese on top of the sausage mix. Gently pour the egg mixture on top. Cover and let it sit in the refrigerator overnight, at least 8 hours. In the morning, preheat the oven to 325°/160°C. Place the casserole in the middle of the oven. Bake for 30 minutes. Turn the heat up to 350°C/176°C. Bake for an additional 20-30 minutes, until the egg is set. To check, insert a knife in the middle of the casserole and it should come out clean. If the casserole is browning too quickly, cover with a foil for the last bit of baking time. Let the casserole sit for 10 minutes before cutting and serving. 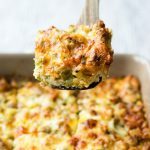 Get this recipe for Sausage and Egg Breakfast Casserole at https://www.theworktop.com/breakfast-brunch-recipes/savory/sausage-egg-breakfast-casserole-overnight/.